Sony KDL-46NX713 review | What Hi-Fi? 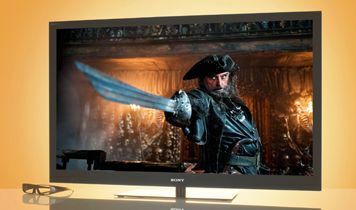 Sony would prefer you consider the NX713 range as a harbinger of its 2011 ranges of TVs. But given the looks and some aspects of the specification of the KDL-46NX713 it seems a bit more like a 2010 straggler to us. No matter. After all, the KDL-46NX713 soldiers on well into 2011 and, besides, one or two niceties aside it’s entirely competitive. Four HDMI inputs, integrated wi-fi and a stack of online functionality, ‘active’ 3D compatibility, edge LED backlighting and Freeview HD reception are emphatically not to be sniffed at. Only the user interface (Sony’s XrossMediaBar is as elegant as ever but it doesn’t really lend itself to supporting a host of catch-up TV widgets and the like) and the need for a separate, Wii-style 3D sync-bar to transmit to the powered 3D glasses, marks the Sony out as anything less than hot off the presses. Thanks to a big, straightforward remote control and exemplary set-up menus, the Sony’s a doddle to fine-tune despite having a lot of adjustability. Build quality and finish, too, are everything we’ve come to expect from Sony. Tuner performance is on the money, with the subtlety of the colour palette and the assured way with contrasts the highlights. Rapid motion or complex patterns can provoke some picture noise and shimmer, but the Sony can hold its head up in this company. That’s equally true for upscaled DVD pictures – the NX713 isn’t immune to some blocking and picture noise, but it’s generally nicely composed and watchable. Switch to 2D Blu-ray and the Sony smartens up its act to deliver clean, detailed and endlessly subtle images. Edges are smooth, motion is solid and stable, and the NX713 once again demonstrates Sony’s impressive mastery of lighting: contrasts here are subtle and utterly credible. A switch to 3D content brings some tribulations, though. There’s no doubt that images are every bit as detailed and well realised as their 2D equivalents – but there’s also no denying the Sony’s susceptibility to head-scrambling crosstalk, the tiring weight of its 3D glasses and the difficulties that rapid on-screen motion can provoke. And while we’re on the subject of shortcomings, the NX713’s emphatically not at its best when delivering on-demand content. We expect Sony to make similar strides in this respect as its rivals demonstrably have, but for now the NX713’s BBC iPlayer streaming looks soft, coarse and blocky – and the same is true of LoveFilm and the like. Sony’s admirable Qriocity platform gives the best results, but these are really no better than middling. It’s lucky for the Sony that the Hitachi screen in this test sounds so poor, too, because the NX713 would be bringing up the rear otherwise. Unlike the 40in variant we listened to a few months ago, the KDL-46NX713 sounds unhappily thin, hard and sibilant. The KDL-46NX713 is a textbook mixed bag, in quite a few ways able to go toe-to-toe with the best 2011 screens we've seen so far, but in others made to look (and sound) a little, well, 2010.